Happy birthday to an extraordinary and talented actor. Happy Birthday to the most gifted actor and musician. Keep up the wonderful work! Happy Birthday Jonathon and many, many more. So happy he is doing another movie!! Can’t wait to see Stonewall!! We miss seeing him!! Ever since dumb NBC cancelled DRACULA!! Even though it’s a lttle bit late, happy birthday and best wishes from Alicante, in Spain. 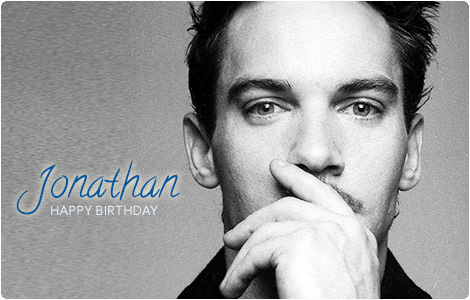 Happy Birthday to you Jonathan. I enjoy your work (acting and music). Enjoy your special day. Happy Birthday and enjoy your special day ! Happy Birthday, I wish you the best of life.